Where the Orchids Grow. : Know when to quit.. If you would like to read a bit more head on over to Lawson and Lotti's as I am featured today on her Sundays Sewing Space. Ooh Leila, I'm in awe. What a beautiful job you've done with your space. Enjoy! Leila it looks great my lovely!! Enjoy it!! What a lovely room. But I think what I like the most is your door, can't beat a G&T when everything has gone pear shaped! You said it! G&T makes everything better! Hey Leila, I am just in the process of turning my spare bedroom into my sewing room so it's interesting to see what you have used. My boys are just putting together a set of bookshelves, I'm desperate for some shelf space for fabric. So nice to have your own space, enjoy using yours. 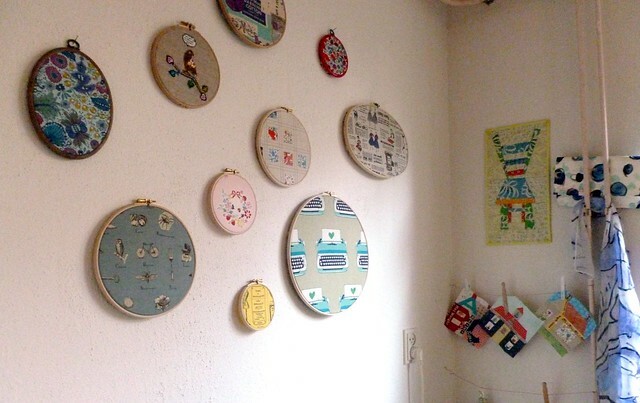 Your space looks fantastic Leila ... and it's lovely to see my little hoop up there!! Are we there yet? I think so!! Enjoy!! Beautiful , love it all but especially the door and the fabric hoops. Lovely space - well done! So beautiful! I am wondering how you painted and finished your little step-stool. I have the same one that is still bare wood and needs a little love! I improvised lol! I painted it white first, I didn't do a neat job I just made sure I had no runs. Then I lightly painted turquoise over it and sanded it down around the edges and in the center of the steps to make it look old and used. It worked out nicely I think. 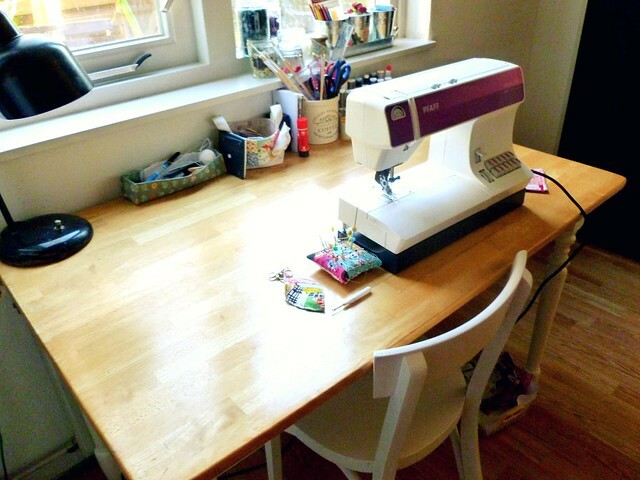 Such a pretty sewing space!! There are so many things in there I love so much especially the polka dots ironing board and those baskets for fabric scraps being on the floor. And I love the idea of the quilt blocks hanging like that! Hope you don't mind I will copy you.. hehe! it's so perfect!!!! i will totally have a gin and tonic with you (my fav), except I haven't had one in years! I love all your desks and storage areas. it's so fun to see where you sew. :) I really want to come over for a visit now! Can't believe how restrained your stash is! It looks just wonderful Leila! Now enjoy sewing! 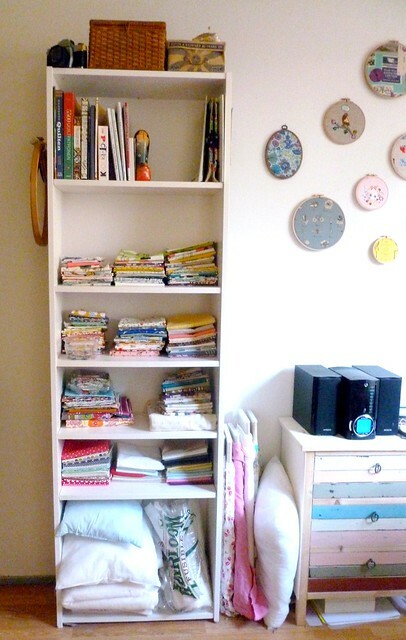 The sewing room looks fab and I am heading over to Lawson and Lottie's to read more now. 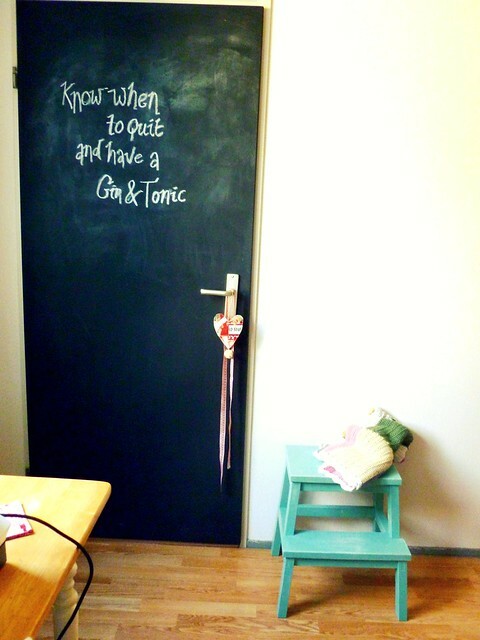 I love the chalkboard door!! It is looking fab! May I suggest a slice of cucumber in your G&T! It's looking great....and I so get the knowing when to quit thing. I sometimes keep going, long past quiting time. Now to pop over to read more..
Lovely, lovely! Now you can sit and create. Have fun!! i love that door! what a great idea! That's a lovely space.. am trying hard not to turn green.. I too love your sewing room chalk door idea! I always sketch out whatever I'm working on, or whatever I'm dreaming up - this would be a wonderful visual inspiration tool for me. One day!! 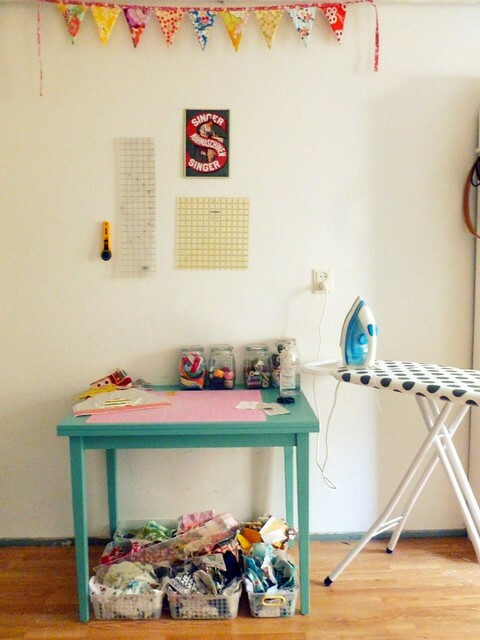 I have the same (pink) Pfaff sewing machine as you. I've never owned a machine I couldn't open up to clean & oil properly before. I'm guessing one has to have it serviced for that. Have you had to do that yet?